The mall (other than the big box anchors, which can operate individually) closed fully in April 2011, shortly after a significant flood of the nearby Pawtuxet River that put the entire mall under more than a foot of water for about a day. (Picture: ) With only four stores remaining inside the building, the owners chose to close down the entire mall indefinitely for a full remodel. The remaining stores were asked to find a new home in the nearby Warwick Mall or another storefront in the meantime. In November 2012, a few owner was announced (Winstanley Enterprises, LLC. of Concord, MA and Surrey Equities, LLC. of New York, NY) and they have claimed to be working on a remodel, with no mention of the supposed remodel announced by the previous owner in 2011, and said they will be working on a new design over the next 6-9 months. It is anyone's guess how long it will take for this to happen, but the mall is effectively dead until further notice. I'm not sure why, but Rhode Island Mall is possibly one of my favorite dead malls. Opened in 1968 as the Midland Mall, this center was the first enclosed mall (other than the Arcade) in Rhode Island. It is located at the intersection of Rte 2, I-95, and I-295, in the city of Warwick (which has earned the nickname the "Retail Capital of the World") Years later, the mall changed its name to Rhode Island Mall. This mall probably received it's first hit when the Warwick Mall opened it's doors right next door on Rte 2. While both malls seemed to co-exist rather nicely, it was becoming clear that Warwick Mall would have the upper hand. The mall sat on a huge plot of land and had a movie theatre outparcel. While the Rhode Island Mall was two levels, it was squeezed into a small footprint leaving little room to grow. In the early 90's, the Rhode Island Mall was starting to slide. It had still retained strong anchors Sears and G.Fox, the store selection was limited. The mall only had 60 stores, and stores with locations in both malls began to close their doors in favor of the bigger Warwick Mall. May company converted the G.Fox store to a Filene's, and then in the late 90's opened a HUGE Filene's store at Warwick Mall. I remember passing between the two malls and laughing at the difference: Warwick Mall had a giant fancy location, while the Filene's at Rhode Island Mall was tiny and sparse. Filene's soon after closed their doors at Rhode Island Mall. At this point, stores began leaving in droves. Gap, Spencer Gifts, and Tape World/Matinee were some of the last remaining national chains. The only reason people came to this mall now was for Sears, or the Dept of Motor Vehicles. A few years later, some life was breathed into the Rhode Island Mall. Kohl's Department store and Wal-Mart both announced that they planned toopen locations there. They were going to each take a floor of the old Filene's space. I'm positive that both stores open into the mall. I have read plans of converting the whole mall into a big-box center, however I don't see the need for one since all of Rte 2 is big box and sprawl. I have also heard unreliable rumors that Community College of RI (whoch is located accross the street) is interested in the space. This was probably before the Walmart/Kohl's addition. It looks like efforts had been made in the 80's to modernize the mall's interior. This street signs look modern, and while the mall only has small skylights, it is kind of airy. The overall design of the building is dated, however. 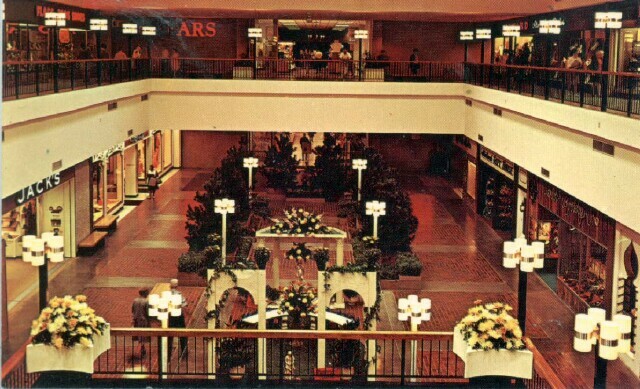 All design notes aside, Rhode Island Mall is a true piece of RI history and will always be one of my favorites. the writer in your story states that Walmart and Kohls open into the mall when in fact they do not. When they tore down Filenes they tore down the food court and about 1/4 of the main part of the mall. They built Walmart and Kohls and everyone assumed they would open into the mall and rejuvenate things. Instead they remained walled off and the mall is still just a desolate shell with a handfull of mom and pop stores. I thought it was a bad sign when the comic book shop expanded to 3 storefronts :-) This was my favorite mall when I was a kid and had a good selection of stores. I still goto sears once in a while and usually take a walk around for nostalgias sake.